This is "Multi-threading" page in EurekaLog project's options. Options on "Multi-threading" page allow you to customize EurekaLog's multi-threading behavior. 1. "Capture stack of EurekaLog-enabled threads" (.csoShowELThreads) option includes call stacks of all EurekaLog-enabled threads in application - regardless of thread type. By default only exception thread is captured. 2. "Capture stack of RTL threads" (.csoShowRTLThreads) option includes call stacks of all RTL threads in application. By default only exception thread is captured. 3. "Capture stack of Windows threads" (.csoShowWindowsThreads) option includes call stacks of all non-RTL threads in application. By default only exception thread is captured. 4. "Pause all EurekaLog-enabled threads during exception handling" (.boPauseELThreads) option will force EurekaLog to suspend all threads with enabled EurekaLog before processing (handling) exception, and resume these threads when processing (handling) will be completed. Use this option if you don't want for other exception to occur in multi-threaded applications when you're displaying error dialog. Alternative to this option is to properly setup exception handling for threads (serialize) or to use restart options. Note: in rare case suspending threads can cause deadlock issues (for example: thread may be suspended when it is running memory allocation function; thus, any further memory alloc/release operation will block application forever). Do not enable this option until really needed. See Using EurekaLog in multi-threaded applications for more details. 5. "Don't pause EurekaLog service threads" (.boDoNotPauseELServiceThread) option excludes internal EurekaLog service threads (such as freeze detection thread, etc.) from list of threads for suspending. 6. "Pause all RTL threads during exception handling" (.boPauseRTLThreads) option will force EurekaLog to suspend all threads in your application created with TThread or BeginThread before processing (handling) exception, and resume these threads when processing (handling) will be completed. • It is recommended to keep this option off and use "Pause all EurekaLog-enabled threads during exception handling" instead. • In rare case suspending threads can cause deadlock issues (for example: thread may be suspended when it is running memory allocation function; thus, any further memory alloc/release operation will block application forever). Do not enable this option until really needed. See Using EurekaLog in multi-threaded applications for more details. 7. "Don't pause main thread" (.boDoNotPauseMainThread) option excludes main thread from list of threads for suspending. Use this option if your event handlers are going to make synchronize calls into main thread. Note: this option has no effect if "Pause all RTL threads during exception handling" and "Pause all EurekaLog-enabled threads during exception handling" options are not enabled. 8. 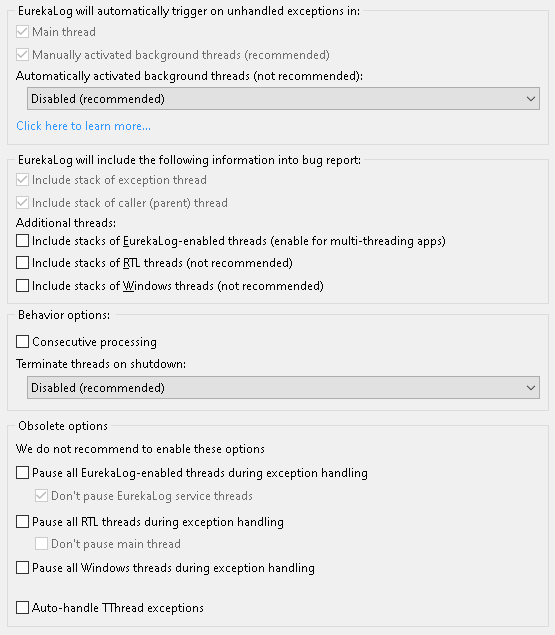 "Pause all Windows threads during exception handling" (.boPauseWindowsThreads) option is equivalent to "Pause all RTL threads during exception handling" option, except this option will suspend/resume threads created with CreateThread function. Those threads are usually system service threads. 9. "Auto-handle TThread exceptions" option enables backward-compatible EurekaLog 6 behavior for threads. When you enable this option - EurekaLog will automatically handle exception in TThread. Default behavior is not to handle exception, but allow it to be saved in TThread.FatalException property, which can be analyzed/handled by caller thread. Warning: enabling this option may result in multiple error dialogs at the same time (if several exception occur in multiple threads) and interfere with custom processing of TThread.FatalException property. • It's not recommended to use this option. You should implement proper error handling for threads instead. See Using EurekaLog in multi-threaded applications for more details. • EurekaLog has to be enabled for the background threads. • If this option is set to "Disabled" - new threads will have EurekaLog disabled. It is recommended value. • If this option is set to "Enabled" - new threads will have EurekaLog enabled. It is not recommended value. • If this option is set to "Enabled for RTL threads, disabled for Windows threads" - threads created with BeginThread or TThread will have EurekaLog enabled, threads created with CreateThread will have EurekaLog disabled. You can turn EurekaLog on/off on per-thread basis by using SetEurekaLogStateInThread function. You can use this option to enable/disable EurekaLog for threads which you have no control of. Like system worker threads, thread pool, etc. You can always change per-thread EurekaLog state manually from your code. It's highly recommended to keep this option into "Disabled" state and enable EurekaLog manually in your threads only - to avoid EurekaLog processing in 3rd party threads. See Using EurekaLog in multi-threaded applications for more details. Important Note: Try to never use "Enabled" option as it will enable EurekaLog for all threads in your application - including internal system threads. Use "Enabled for RTL threads, disabled for Windows threads" instead of "Enabled" when possible. • If this option is set to "Disabled" - EurekaLog will not terminate any threads when application is exiting. It is recommended value. • If this option is set to "Terminate all threads" - EurekaLog will terminate all background threads. • If this option is set to "Terminate RTL threads only" - EurekaLog will terminate only threads created with BeginThread(Ex) and TThread(Ex). EurekaLog will not terminate threads created with CreateThread. • If this option is set to "Terminate EurekaLog-enabled threads only" - EurekaLog will terminate only threads which have EurekaLog active, regardless of creating function. Normally, your code should gracefully shutdown any background thread before you attempt to exit application. However, if you fail to do this (for example, using when using TThread.FreeOnTerminate) - a working background thread may interfere with shutdown (especially if there would be exceptions or leaks). While it is always better to refactor your code so it will stop threads before exiting application, you can use this option to terminate background threads on shutdown. Important Note: Enabling this option may hang your application at shutdown, because EurekaLog may terminate background thread right when it is holding some sort of global lock.